The Seahawks had an unplanned team meeting last week. But it probably didn’t cover going 0-for-7 from the one-yard line. Nor the prospect of tackling their leading rusher in the playoffs. The Seahawks had an unplanned team meeting Wednesday that dealt in part with CB Richard Sherman’s criticism of play-calling in the Dec. 15 game against the Rams, coach Pete Carroll disclosed Monday. He didn’t say what was said, but did say the rare confab also included a message about helping younger players prepare for the playoffs. A guess here is that he didn’t address the two developments from last winter that are the driving forces behind two losses in the past three games that is so unlike the Seahawks’ modus operandi in previous Decembers. The first is the failure to develop an adequate plan for the retirement of Marshawn Lynch, and the second is the failure in free agency to find adequate help for the offensive line. RB Christine Michael likely will lead the Seahawks in rushing with 469 yards. And he plays for the Green Bay Packers, who could end up as the Seahawks’ foe in the first round of the playoffs. The only way the Seahawks advance to the coveted No. 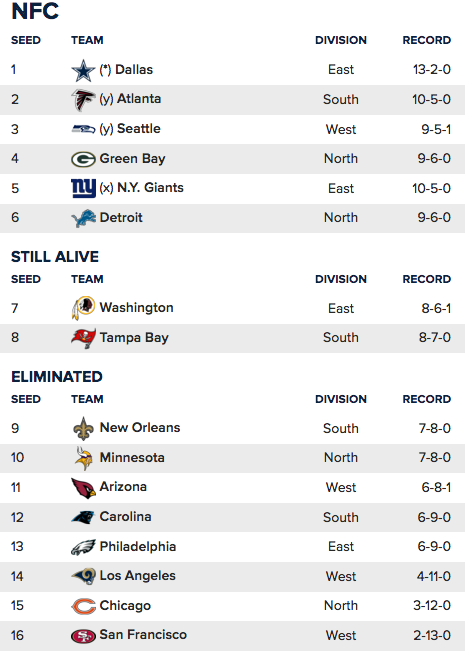 2 seed and its coveted bye is if they beat San Francisco and No. 2 seed Atlanta loses to New Orleans. Regarding how the Seahawks arrived here, the two offseason failures, combined with bad health luck, have left the Seahawks as the weeniest they have been since playoffs became part of the winter festival here five years ago. I say weeniest because they ran for 78 yards against Arizona in 27 tries in a 34-31 loss Sunday, and 72 yards in 30 tries Dec. 15 against Los Angeles in a 24-3 triumph. The latter total included 26 yards on a fake punt that nearly turned into a suicide mission by Jon Ryan. But it was the only rushing play beyond 16 yards in the past three games. 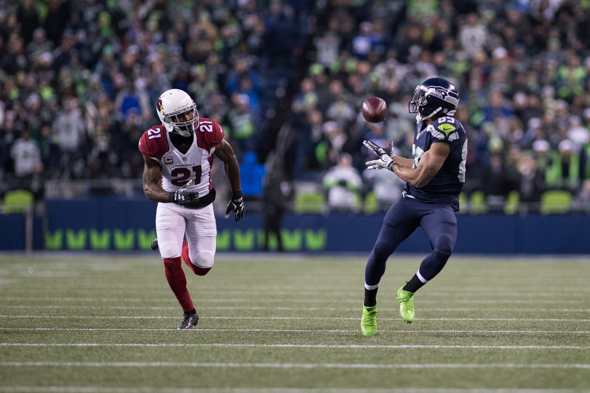 Lynch would get 16 yards walking away from Carroll on the sidelines. The problems with the offensive line have been documented since roster formation began after J.R. Sweezy dashed for cash at the beginning of free agency. But a milestone little noted was reached Sunday: Placing RT Bradley Sowell on the healthy inactive list before the game meant that the Seahawks were without the only free agent linemen they signed in March. The other one, J’Marcus Webb, was cut Nov. 22 after never showing he was even a subpar NFL lineman. The Seahawks, and every team, whiff on free agent signings every year (Sweezy didn’t play a down this season after back surgery following his $32 million signing). But when a team is as top-heavy in salaries as the successful Seahawks, whiffing twice in the same positional unit is bound to leave a mark. It did, on QB Russell Wilson’s knee and ankle, the result of poor pass protection that has lasted through Sunday, when he was sacked five times in the first half and hit 14 times in the game. That certainly wasn’t the fault of Sowell and Webb, as they likely would be eager to point out. The five guys who were out there — two rookies (George Fant and Germain Ifedi, second-year Mark Glowinski, and third-year guys Justin Britt and Garry Gilliam) were overwhelmed in the first half, replete with communication mistakes and poor technique. His point was made in the second half, when the same guys against the same defense produced 297 yards of offense and 28 points. “The main thing that we take away is that we did in the second half,” he said. “We were in sync, sharp, productive and physical. That was the biggest thing that jumped out. How that happens is up to line coach Tom Cable. But even after the New Year’s Day game against San Francisco (2-13), almost nothing more can be learned about their learning curve. The 49ers have the league’s worst run defense, averaging 4.9 yards per play. Even a 41-3 win with 200 rushing yards is a false positive, given the frailty of the foe. What is known is that the Seahawks are one of several good, flawed teams that will muck about in NFC playoffs — all but Dallas have at least five losses. But absent from the Seahawks will be the menace and ferocity of Lynch that so distinguished previous Seattle playoff teams. And it wasn’t just the the on-field production. Even as the anti-authority Lynch irked his coaches, he was a locker room hero to his teammates for that and a host of other psychological virtues. Granted, his absence has been known since he hung up his cleats in a tweet during the Super Bowl. But the Seahawks drafted three rookies and re-signed once-scorned vet Michael in the hope that the collective could be at least league average. Instead, they are 22nd, at 100.3 yards per game. Last year they were third at 141.8. Most embarrassingly against the Cards Sunday, they were 0-7 in first-and-goal from the one. Depending on how the seeds fall in the final games next weekend, it could be Seahawks-Packers. I’m guessing the team meeting with Carroll last week didn’t cover how to tackle your team’s leading rusher. Trump or Biden behind Obama. It just ain’t right. only interested in the defensive side of the ball. The offense can fend for itself. quite. I don’t think he would cut his kids if they stepped out of bounds half a step ahead of getting hit by a freight train. If anyone is not willing to put their body on the line they will be summarily cut from the team. See: Christen Michael. 4) His bizarre obsession with copper colored fry-pans shown on infomercials. 5) Calling a pass over the middle on the goal line to end Superbowl 49. Not to harp on the play to end all disastrous plays, but Belichek was beaten on that play a couple of years before. Carroll or Bevell no doubt knew that. That instance was the famous play against Indianapolis when Reggie Wayne shook off the fade route with about 15 seconds left, the game on the line, and asked for the inside slant. Of course, the Hawks did not have a Wayne/Manning connection to make that work and that pass has to be thrown about 2 feet off the ground in those close quarters. Manning could throw that pass in his sleep and Reggie was the spectacular dog that could sell out and get it. Wayne was an incredible possession receiver. First ballot hall of famer. Could be true. I bet the inside slant wasn’t invented by Carroil. The point I’ve always made was the pass call was fine, just not that pass to that receiver. Lockette was not an inside guy, he was a speed guy. If it occurred to them, then obviously that would be the play to not call right then. It would have been dumb of someone on the Hawks sideline to think they would beat Belichek on that play. I’ve heard of any number of parents putting their kids on waivers. I mean, we’re all over 18 here, right? 2) What if they just didn’t see the help they were looking for that they thought could contribute on the OL? Remember, Cable’s zone blocking scheme requires familiarity with the scheme and repetition to run effectively. It’s not exactly plug and play where a journeyman off the street could come in with an instant learning curve. I think they deserve the benefit of the doubt that John’s always got his eyes peeled on upgrades that can help the team and would jump at the chance for a lineman they thought could help them immediately. 3) Michael was given shot after shot to reform his habits. Cut, resigned, and given 6 weeks of ineffective play before being cut again. Sorry but I think most parents would get fed up by that point too. For once, just one time, would like to see “Pete” get mad. The happy-go-lucky awe shucks gum-chewing shtick is getting old. What if that’s his nature? If he did what you asked, wouldn’t that make him a phony? Well said, Art . . . They lost their swag when Lynch left. It’s time to lower expectations. Losing Thomas is a crushing blow & they are gonna have to open up the offense to have any chance. Spread the field, let RW adlib & get Graham eight or more catches a game. A Packers rematch would be tasty. Badasses were Lynch and Thomas. Tough to compensate. To truly open up the offense they need guys who can pass block for more than 2 seconds so plays can develop and Wilson has the option of throwing deep. As it stands, he doesn’t have that. Barring a Sounders-like turnaround for the playoffs, I’m treating this year as a market correction, one step back to take two steps forward year. Clear some cap space after the season to build up depth and the offensive line (Russell Okung’s loss was underestimated). Schneider and Carroll have had an off year, but their track record certainly gives them the benefit of the doubt. Here’s an interesting question. Who’s hated more by Seattle sports fans, Bevell or Alex Rodriguez? A-Rod, by far. That was all about personality. Football fans like to think they are as smart as OC’s, when there’s no reason to think so. Russell Okung has been terrible in Denver. The team is fortunate it dodged a bullet and Okung didn’t accept the big contract offer they made to him that most certainly didn’t contain the opt out clause that Denver has for Okung’s contract. If he stays upright, as he did in the second half. Just a quick question Art, do you believe that the Pete and John show may be coming to the end of days for those two? They’ve done a great job of putting a championship program on the field. But it seems like something is amiss, could it be they’ve grown tired of trying to placate the egos of a few players that demand a kings ransom of the salary cap that leaves little to no money for cap room. Leaving them no choice but to shop at the dollar store for O-lineman. I’m certainly not advocating a change, but perhaps a change of philosophy on going forward. I’ve broached this opinion recently in other blogs and was threatened with boiling oil and pitch forks, and I expect the same. I enjoy your articles and look forward to your voice of reason perspective. What do you mean “leave them no choice”? Pete and John control the show. If they have little left for offensive linemen and Pete spends time placating big egos it’s because that’s the way they wanted it to be. If they were tired of it they would change the formula. Thanks for the reply, we’re now dumber for reading this. I’m sure that’s why you saw boiling oil and pitchforks because your claims don’t sync with reality. That’s the definition of dumb so I disagree, you can’t really get dumber. You get a gold star for being clever, now go tell your mom you need to go outside and play. Hey, don’t get all pissy with me just because no one takes you seriously. If you were smart you’d realize by now that when it keeps happening, it’s because your opinion lacks credibility. Your problem is you’re not. Pissy? How cute, your sister teach you that? You’ve unfortunately lost track of where my original question was directed to. Not you, it was to Art. Enough is enough. Have a good day. Go Hawks. lol. Whatever bizarre association you have with piss and your sister I really don’t want to know about it so please keep it to yourself. Oh, I guess you didn’t notice you posted in a public forum and Art hadn’t replied. It must be lonely feeling so irrelevant. You should show some gratitude that I at least took the time to acknowledge your opinion, even if it was only to point out the absurdity of it. You are a dog on a bone kind of guy aren’t you? You’re hilarious, and yes I truly do appreciate your kind and thoughtful input to my obviously irrelevant opinions. We’re blessed to have an intellectual person like you gracing this blog with your insightful educated opinions for us poor minions to learn from. Please post more opinions for us to gain much knowledge from someone as intelligent as yourself that has so astutely pointed out. Happy New Year to you and may your wisdom continue to grace us with your much needed opinions, may you make America Great Again. Now get lost!!!! I’m done, you win. Kids, can’t we play nice? Everyone’s entitled to an opinion on a lumpy Seahawks season. I understand 2nd’s query, and just now offered my thoughts, FWIW. No need to come out of this thread looking lousy like Rousey. Thanks Art, that’s all I was seeking from you. Things went sideways, partly my fault. Keep up the good work. Reaching and sustaining excellence is a harder task in the NFL than any other team sport because of the hard salary cap. Carroll and Schneider have proven they can do it. Injuries, not egos, are the primary culprit this season. You can make the case that Wilson’s injuries are a result of meager investment in the OL, and I’ll buy that. But managing people is Carroll’s best skill. He got five tense years out of Lynch, which I don’t think any other NFL coach could have done. No need to change philosophy.